On this page I intend to post articles and other media related to soaring safety that I find particularly important or relevant. If you have a favorite safety piece yourself, perhaps one that has a particular meaning to your own experience, please share it with me (along with its source) and I will consider adding it to the list below. Where are the Ghost Gliders? or: How Dangerous is Soaring Really? I’ve researched the safety record of soaring when compared to other activities and written about it on my Blog. Safety in Mountain Flying. Excellent booklet published by the Centre National de vol à voile, Saint-Auban, France, Dec 2011. Also available in German and in French. Paranoia as a Virtue, by Bob Wheelan, Soaring Magazine Nov 2007 p. 26-29. 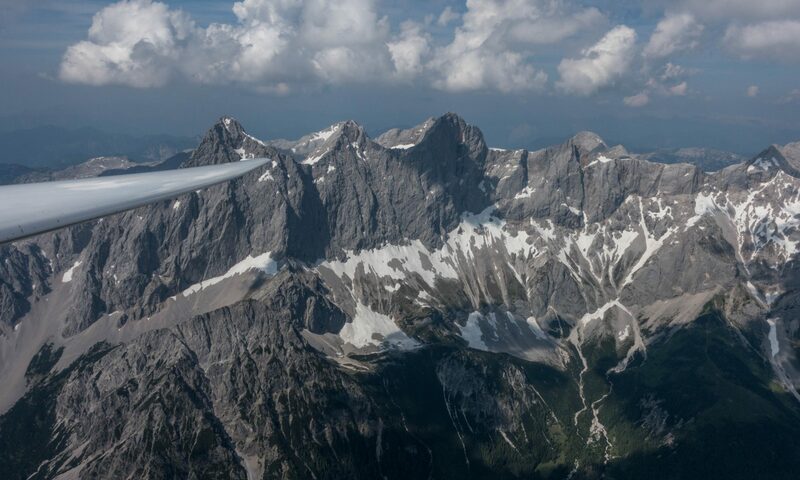 Written by Boulder pilot Bob Wheelan, this article recounts three very challenging experiences in the landing pattern and underscores the importance of a safe pattern altitude. Share Your Experience (in German). Link to several articles in the magazine “Segelfliegen”, in which glider pilots share some dramatic experiences and what can be learned from them. Tow rope gets stuck at the nose wheel (in German). Glider rolls over tow rope on the ground, rope gets stuck in nose wheel (unbeknownst to either pilot) and glider and tow plane remain connected upon release. Neither pilot notices until both planes are in a critical situation and tow pilot is able to release. Preventing soaring accidents (in German). In-depth article discussing root causes of gliding accidents and steps to reduce risks. Recommendations include a) specific training of standard procedures in order to respond correctly to typical risk-prone situations (e.g. rope brake, stall, spin-entry, in-flight collision, cloud-entry, oxygen system failure, etc. ); b) adherence to standard operating procedures at the airfield (e.g. rigging and de-rigging, ground handling, pre-flight checklists, staging, landing pattern procedures, etc); c) creating constant awareness of individual risk factors (e.g. grass too tall, canopy not properly locked; weight and balance check omitted, airbrakes not locked, tow speed to low or irregular, tow-rope damaged, etc.) and thereby minimizing the probability that multiple risks materialize simultaneously (a frequent cause of accidents); and d) frequent and consistent dissemination of all relevant information to all participants in flight operations. Complacency – What Me Worry? Safety talk by Martin Hellman illustrating how 99.9% safe maneuvers frequently result in complacency about the risks and too often in accidents when the same maneuver is repeated in the future. The examples he gives include low passes, close-in ridge flying, crossing ridges or mountain passes at low altitude, getting enveloped in clouds, and landing out. Experienced pilots who have many such maneuvers under their belt are ironically (but logically) most at risk. Spin Avoidance Nice safety video illustrating how too much rudder in a turn can cause a glider to spin-in even if the nose is well below the horizon. Rogue Air Currents. Excellent article illustrating the existence and effects of narrow and extremely powerful updrafts and downdrafts at all altitudes. It is likely that these played a role in many an unexplained accident. Safety Pays! A proposal to the International Gliding Commission (IGC) to make gliding a safer sport. It includes some sobering statistics about the real and remarkable dangers of soaring: on a per-hour basis gliding is estimated to be approx. 70 times more dangerous than participating in road traffic. The risk of an average glider pilot to die in a gliding accident in any given year is approx. 1 : 2500. That is equivalent to 1 death in 70,000 flights. For flights during competition the risk is even 10-11 times greater than that: i.e., competition pilots die at a rate of approx. 1 in 6,700 competition flights. Glider Accident Database. Worldwide wiki database of ~6000 glider accidents. It’s shown in chronological order (scroll to the bottom for the latest accident and click on link for writeup of the circumstances and causes). NTSB Glider Accidents. Database containing detailed reports of all reported glider accidents in the United States. Versa Reports, Austria Collection of sailplane accident reports in Austria (in German). Comprehensive Study of glider accidents in France between 1990 and 2001.